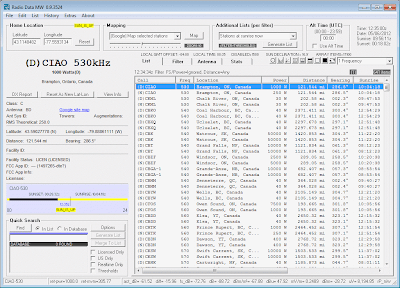 Let's continue with our topic of governmental radio station databases and create a customized Canadian AM list for our mediumwave DXing use. A previous article on RADIO-TIMETRAVELLER, Radio Station Databases 101, discussed several governmental databases that are available online. The Canadian database is one of them. 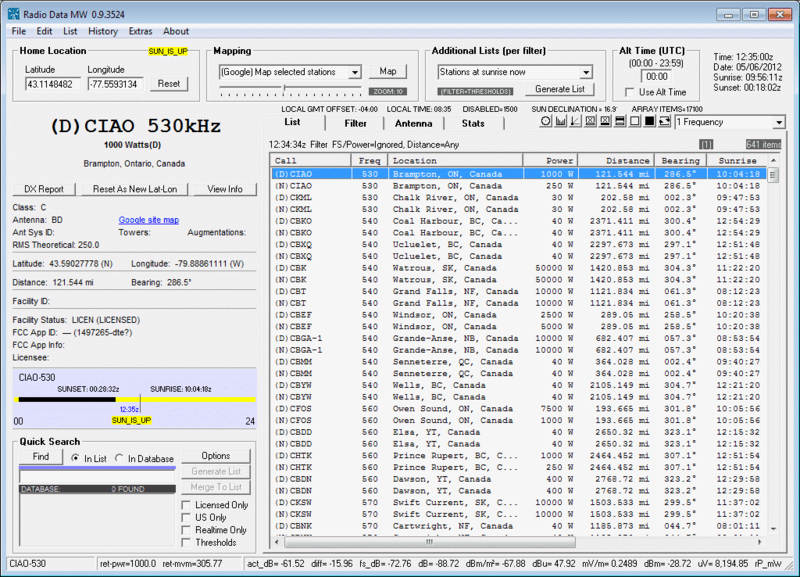 Using the Radio Data MW program, I set out to make a Canadian AM station list right from the official files. Canada has a nice AM Query of their own, like the FCC's AM Query. But also like the FCC's, the output does not tell the entire story, leaving out detailed technical information. We are in luck, however. It turns out that Canada's AM Query searches a deeper database just like the FCC does, so much of the information is available, though hidden. The Industry Canada engineering database houses the files we need. Links are shown just below. Rather than simple text files, Canada has chosen a dBase file format (.DBF) for its files. Download and unzip baserad.zip and you will see the many files that comprise Canadian broadcast - AM, FM, and TV. Though the records are somewhat textual in nature, they are more like XCEL records and a text editor cannot be used to view them. You must use a specialized viewer in order to look inside. CDBF for Windows by WhiteTown Software is one such viewer, which also offers file conversion utilities. A demo version is available, though it it is only usable for a short time. Other DBF file viewers with conversion abilities are also available, notably the free Exportizer. What we need to do is convert the DBF file to a readable text file so we can process it. We will use Exportizer to open the Canadian DBF file and convert it to a comma-seperated values (.CSV) file, readable by Radio Data MW with some simple tweaking. So which file do we use to gather information on Canadian mediumwave stations? From the Industry Canada database files, one file stands out that will give us most of the information we want: callsign, frequency, transmitter latitude and longitude, station class, and daytime and nighttime powers. That would be the AMSTATIO.DBF file. Comparable to the FCC's facility.dat file, Canada's AMSTATIO.DBF file contains basic station information. But also like the FCC's facility.dat, it contains many stations outside Canada. The current AMSTATIO.DBF file I have (dated 4-20-12) documents some 9503 station facilities from not only Canada, but the United States and Mexico as well. We will have to strip out the unnecessary country data. Easy enough. Now on to the results. I have created a list of the current, operational Canadian AM stations in .HTML form which will display nicely on your computer. A .CSV type file is also included which may be read into a spreadsheet form. The list contains only licensed stations. Nothing in this list has been verified on the air, though it is official and right from the Canadian governmental files. I have calculated local sunrise/sunset times for all stations for this date (5-6-12). The Canadian AM broadcast service is comprised of 321 station facilities, transmitting in 641 services (daytime service and nighttime service), with varied station classes of A, B, C, and LP (low power). 34 class A stations, 249 class B stations, 74 class C stations, and 284 low power stations round up the list. For those curious about output powers, 48 stations broadcast at 50KW during the daytime, 40 during nighttime hours. 8 broadcast between 10,001 watts and 49,999 watts during daytime hours, 10 during nighttime hours. 66 broadcast at the 10KW power level during daytime hours, 53 during nighttime hours. 57 broadcast at power levels between 100 watts and 9,999 watts during daytime hours, 75 during nighttime hours. Stations broadcasting at power levels below 100 watts are considered low power facilities, and are licensed as such with the special license class of LP. There are 142 of them. CBPC-1 and CBPD-1, both out of Glacier Park, British Columbia, have the lowest power level at 5 watts, day and night. Canada has 122 graveyard stations. 61 broadcast during daytime hours, 61 during nighttime hours. Canada has 6 X-band stations (1610-1700 KHz). What software is that in the last screenshot in this post, the one with "Radio Data MW" on the title bar? Is that the CDBF for Windows you mentioned in the post or something else? Radio Data MW is a program I have been developing for about three years. I have a couple of thousand hours in it (35,000 lines of code). Basically, it takes the FCC database and a couple of others and lists stations by distance and signal strength according to your home location. It does many other things, like plotting antenna patterns, mapping, graphing, etc. Using a filter, you can filter stations any way you want. Not quite ready for prime time unfortunately. Maybe some day I'll release it. I plan on featuring it more in this blog to show what it does. I am interested in the programming language used to create the "Radio Data MW", which language are you using? The program is written in the old but always functional Visual Basic 6. At the moment it approaches 50,000 lines of code and I've been developing it over the last 4+ years more as a hobby and personal curiosity than for any other reason. It is also used to produce HTML pattern maps, which I have posted on the blog. Thanks Bill for the reply!! I was leaning towards perhaps C# Language, good to know!! I look forward to you having the "Radio Data MW" application made public! !